The spiral-bound edition is heavy duty. When open, it lies flat. It’s a workbook. If you prefer the details inside your phone, there is the eBook. That’s the genesis of THE RIGHT SPACE. Its 300+ isometric drawings have width, depth, and height. They make wheelchair access easier to understand because you can see what it looks like. 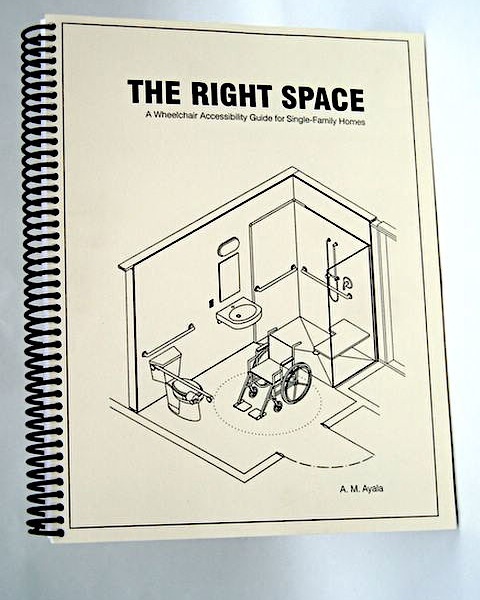 The pictures floor spaces, doors, passageways, bathrooms, kitchens and more show you what is essential, the ability to enter a home and use any fixture in any order. With them you can create a safe, attractive home for your family and your guests—a wheelchair accessible home.